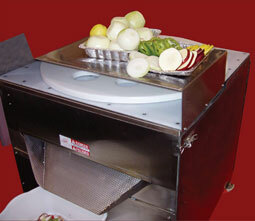 Peeled onions are placed in top-holes, top-holes rotate to safety guard and are then dropped to slicer blades. The onions are perfectly sliced to your desired thickness. The Onion Slicer can have from 8 to 12 holes, and holes range from 3” to 6” according to your needs.Easily adjustable from 1/8" to 3/4" slice thickness. The slicing knives are 10" in dia. and rotate at 200 r.p.m. Each slicer top is built according to your preference. G-OS 120v - 1 phase 52" x 36" x 36"